The Waimānalo Hawaiian Homestead Association board, Hawaiʻi legislators, Travois and Pacific Growth Associates gathered at the entrance of the new Waimanālo Community Technology, Education & Employment Center in ceremonies led by Kahu Paul Akau. WAIMĀNALO, O‘AHU – The Hawaiian homestead community of Waimanalo celebrated the blessing of their new Community Technology, Education and Employment Center (CTEEC) earlier this week. The $7.2 million facility will be a gateway for community learning, employment training, and e-commerce business development; and will also provide Internet access, distance learning and technology training. CTEEC also creates an “Economic and Technology Zone” that will provide access to high technology and information business incubation services in partnership with local schools, colleges, and other non-profits, and private businesses. The new center includes a business center providing copying and computer internet connectivity; two large classrooms, and a recording studio. All rooms with the exception of the business center will be available for rent at a reasonable price. The Waimānalo CTEEC was the product of hard work and dedication of the Waimānalo Hawaiian Homes Association (WHHA), the Hawaiian homestead association representing approximately 750 homesteaders in Waimānalo. 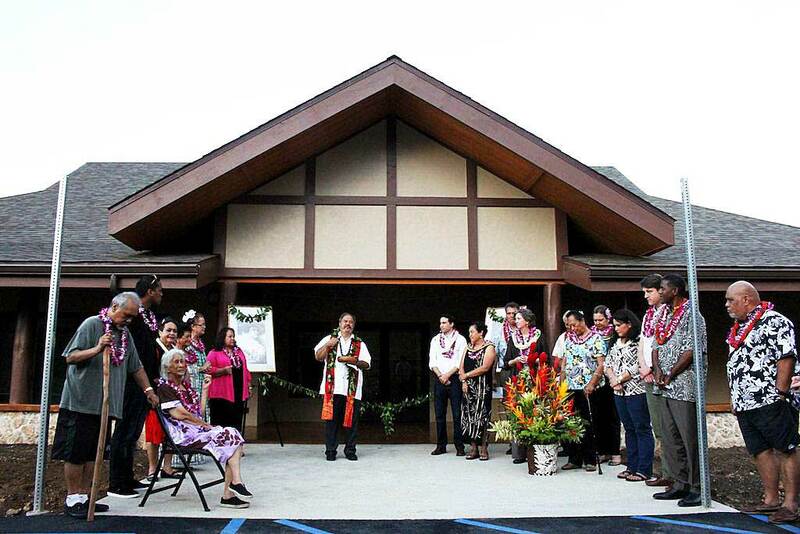 The WHHA was joined by Hawaiian Homes Commission Chair Jobie Masagatani, Sen. Cynthia Thielen, Rep. Chris Lee, community leaders, financiers, and WHHA partners at the blessing Monday evening. The CTEEC project was first conceptualized by the Administration of Anthony “Uncle Tony Sang, Sr. serving as President of the State Council of Hawaiian Homestead Associations (SCHHA). Hawaiian homestead leaders developed project management skills in undertaking and managing the processes involved with designing, planning and implementation of their own CTEEC on Hawaiian Home Lands. The CTEEC is Phase IV of the WHHA’s Ka Ho‘oilina Na Kūhiō Community Center. WHHA completed Phases I-III, which consists of a certified kitchen, healthy screening facility, office spaces, storage rooms, hālau, and an opened landscaped lawn area. Phases I-III were developed over a 10-year period an at approximate cost of $2.5 million funded through grants and undesignated funds generated through WHHA activities. Funding for the new facility derived from a New Markets Tax Credit (NMTC) investment coordinated by Pacific Growth Associates. Travois New Markets provided the $7.2 million in NMTC financing. Wells Fargo, the NMTC investor, committed $2.06 million in equity. The Hawai’i State Legislature also provided a $750,000 Grant-In-Aid and the Department of Hawaiian Home Lands provided the General Lease comprising of approximately 3.638 acres.